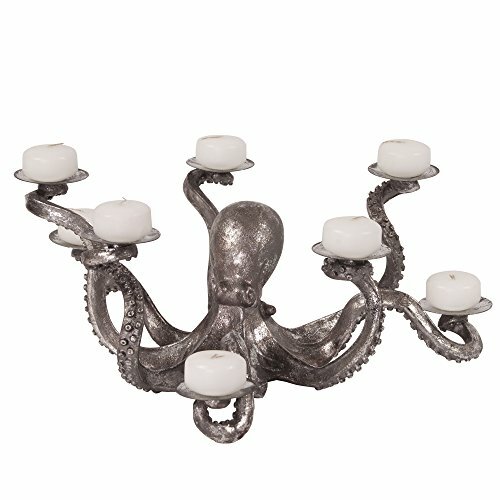 The Octopus Candle Holder is an Octopus sculpture that features a flat disk on each leg to hold a small pillar or votive candle. If it wasn't for the antique pewter finish, you would swear this detailed piece could move. Dimensions: 20-Inch by 16-Inch by 7-Inch. Made of resin. The Howard Elliott Collection is one of the premiere manufacturers of decorative mirrors and accessories in the home furnishings industry. Howard Elliott attributes their success to innovative designs, a broad variety of styles and sizes, unique combinations of raw materials and extremely competitive pricing. All Howard Elliott mirrors and decorative accessories are hand finished.